Digital displays in business environments are transforming from experimental to must-have technologies. Think of the first waves of digital signage in many business verticals, where the presence of screens sometimes had more to do with futurism and “wow factor” than with fully developed deployment strategies. That’s no longer the case. Businesses are using professional displays of all types and form factors with very specific objectives in mind — placing screens strategically and using a wide range of tools to maximize relevance and transform experiences. That message — why businesses are now able to modernize with displays — will be a driving point behind Samsung’s presence at the Digital Signage Expo (DSE) this year, where we’ll be showcasing our best-in-class offerings and how they impact every industry. Many technologies have emerged, matured and converged to make it possible to effectively and efficiently tailor and personalize messaging. The rollout of digital signage technologies has largely been guided by the phrase, “Right message, right time, right place.” The primary difference now is that the foundation for targeted messaging is no longer defined by guesswork and a lot of resource time goes into getting those things right. Real-time data generated by business systems and sensors, plus programming tool sets that make it simple and seamless to access and use that data, power the creation of relevant messaging on the fly. Instead of tasking someone to develop messages, then planning when and where they should run, and finally scheduling those messages based on rough ideas of how they’ll do, messaging can be autonomous and dynamic. It may sound complicated, but it’s really not. 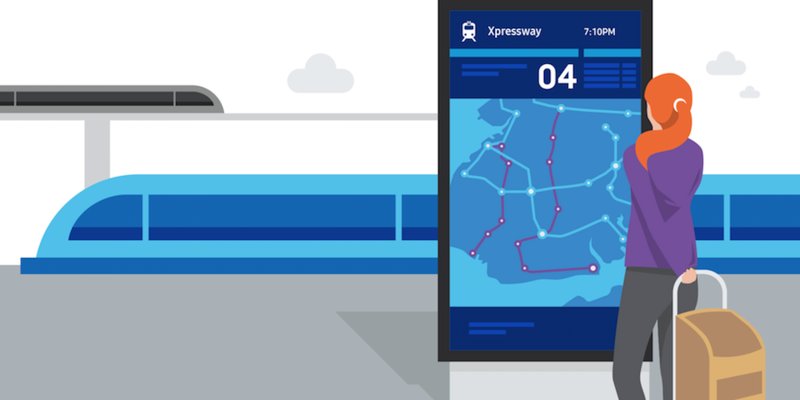 Here are some examples of how modern digital signage now looks across major industries. In retail, screens are evolving in numerous ways. Brick-and-mortar stores are putting them in place now to attract, guide, inform and deliver experiences. Retail decision makers who attended the National Retail Federation’s tech-focused annual trade show in New York saw dozens of examples of companies using cameras and other sensor technologies to develop and deliver actionable insights about what’s happening on shop floors. Those retail intelligence systems are providing rich, real-time information on how shoppers move around stores of any dimension — where people go, where they dwell and how long they stay. Some systems use cameras and high-speed computing to capture and analyze face patterns to provide artificial intelligence-based estimates on the gender, age range and even the emotional state of shoppers. On-premise messaging displays can then serve messaging that’s better suited to the prevailing “audience” in that area or overall store and boost both attention and sales. Learn how to leverage high-brightness displays to deliver clear, compelling communications in any weather. It’s possible, as well, to effectively set the equivalent of web browser “cookies” for shoppers, based on their faces or anonymous information like their smartphones’ unique IDs, to then customize messages and offers on screens — tapping into loyalty program data and buying histories. Retailers are increasingly using interactive displays, equipped with the same slick, snappy touch experiences we know from our smartphones and tablets, to address some operational challenges. Interactive screens, for example, can list, locate and enable orders on products that are not stocked on shelves because of the store’s overall size. This is the “endless aisle” strategy working for everything from beauty brands to automakers who want a presence in a high-rent retail district, but also want to control operating costs by shrinking the store footprint. Shoppers can find items they want and have them shipped to that store for pickup or delivered to their homes. Interactive displays are very effective in allowing shoppers to do self-directed product research on a larger, far more readable canvas than their smartphones. For complicated electronics products, or for cosmetics or nutritional products that are composed of a variety of ingredients, a screen provides on-demand specifications, video demos and prized consumer reviews. The screens offer convenience, but also curate and control the message in ways not possible when consumers do on-the-spot web searches from their smart devices. Screens are also improving the experience for shoppers looking for new outfits. When consumers try on items in front of an interactive mirror, they can then use that same screen to select recommended pieces that complement an outfit, like a handbag or hat, or different colors or patterns. Touching the screen can signal an associate to collect those items and bring them to the fitting room. The hassles of redressing just to get a different size or color of an item are gone for shoppers, and sales climb because shoppers keep trying out new options. Large format LED and LCD videowalls are steadily replacing printed graphics on store walls, adding full motion with high-impact visuals that reinforce the brand and set the tone for the store. In quick service and fast casual restaurants, for example, it was a big deal when digital displays replaced printed menu posters. It meant restaurants could easily showcase different menus at different times of day and replace information quickly using software, instead of slowly ordering, shipping and then putting up new print material. Now, what’s on menus and promotional displays — when integrated with on-premise or cloud-based restaurant management systems — can change automatically. When the inventory system says the store is out of almond croissants, they disappear from menus without employee input. When an item is underperforming and stocks are high, the frequency of promotions can increase based on a data rule in the software, or the store manager can change the price point in the point of sale (POS) system and see that adjustment automatically reflected on screens. This, of course, speaks to the more holistic use of signage both indoors and outdoors, and the impact it has in communicating between the business and its customers. Outdoors, analytics are increasingly used to dynamically change messaging on the promotional presale and menu/ordering screens in drive-throughs. Technologies such as license plate recognition and pattern detection systems can trigger different messaging on high-brightness outdoor displays in the drive-through lane, based, for example, on vehicle types — a minivan or SUV may have a different typical order profile than a sports car. Those are just some of the ways we’re seeing businesses of all kinds adopting professional displays — from big statements on videowalls, down to much simpler but impactful technology like high-brightness, street-facing window displays that attract passing pedestrians. In all cases, the goals are to create better experiences, influence decisions and drive business objectives, whatever they may be. We’re excited about the future of digital signage and what it means to your business. Regardless of where your company is in the technology adoption journey, Samsung provides the opportunity to transform your workspaces and create new experiences for you customers. Prepare for your digital signage deployment by exploring Samsung’s full line of professional display solutions.